You will find here our selection of Triumph motorcycles, fully equipped and ready for your trip. Wether you choose the twin cylinder Bonneville, or the 3 cylinder Tiger, it will make your trip unforgettable. Triumph motorcycles rental There are 2 products. From 109 € per day, 300 km included, 650 € deductible. Rent your Triumph Speed Twin ! 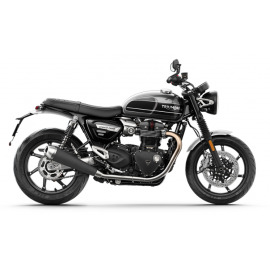 The latest modern classic motorcycle from Triumph offers a great look, modern engine and fun ride ! GPS, 2 side cases and waterproof bag on luggage rack.